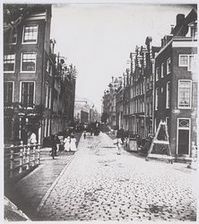 Some data, made available by the Institute of Dutch Jewry from the Amsterdam town archive we present here: the Cassuto's living in Amsterdam around 1850-1853, together with some ancient photographs of the streets from the jewish quarter, where Juda Cassuto and his sons lived (derived from the picture archive of the Amsterdam town archive). Aangegeven nummering tot (ingang) Korte Houtstraat. 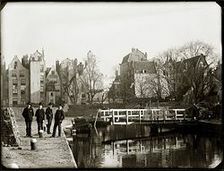 Bluswerkzaamheden bij brand van nrs. 21-25. 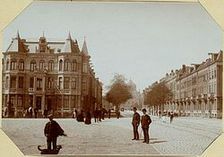 Gezien richting Leprozengracht (Waterlooplein).